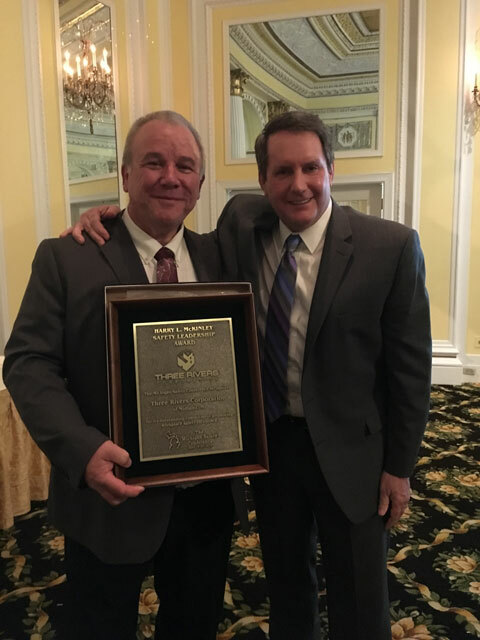 MIDLAND, MICH. – Randy Sherman, President and Paul Crivac, Safety Director, accepted the 2016 Harry L. McKinley Safety Leadership Award by the Michigan Safety Conference on April 19, 2016 in Grand Rapids, MI. This award recognizes an employer each year that exhibits leadership commitment and strives for significant and sustainable results for environmental, health, and safety excellence in the workplace. The Safety Leadership Award is earned through documented establishment of safety and health programs, which have reduced the frequency and of injury and illness in the workplace. Companies that have demonstrated innovative techniques and safety processes to improve safety performance are also considered for this award. Three Rivers’ is honored to have won this award. “This award demonstrates the commitment our people have to our company and the clients we work for. Safety isn’t just a state-of-mind. It’s a way of life at Three Rivers.” said Randy Sherman. Three Rivers Corporation (www.TRCcompany.com) provides design and construction services to the Industrial, Commercial and Institutional markets. They specialize in Design Build, Mechanical and General Contracting and Construction Management.